The ghumott (Konkani: घुमट or ಘುಮೋಟ), ghumot, gumot or ghumat is a membranophone instrument from Goa, India. 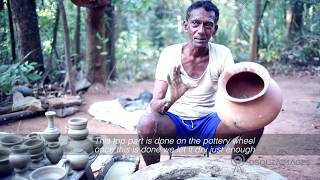 Ghumat is a percussion instrument of earthen vessel having both sides open; on the bigger opening a leather (drum membrane) of monitor lizard is mounted. Generally ghumat is accompanied by ‘samel’, another traditional instrument with wooden drum and goat leather mount. This instrument is still very popular amongst by the Konkani diaspora. 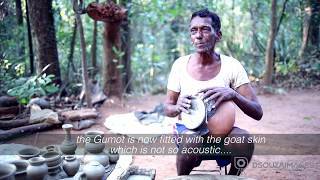 Ghumat forms an integral part of Goan folk, religious and temple music, both Hindu and Christian. 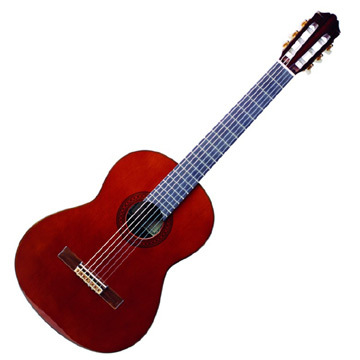 It serves as an accompaniment to the folk songs and to the mando music. 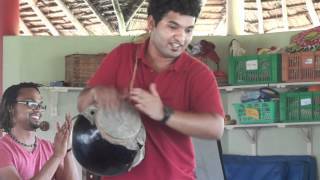 But most importantly it plays a vital role in the music played in Goa during the Ganesh festival. It also used in most of the Goan temples during the spring season in an orchestra called as Suvari Vadan. Khaprumama Parvatkar was one well known artist of this instrument. This percussion instrument is also played to accompany folk songs in some areas of Karnataka. 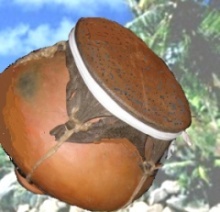 In Andhra Pradesh, this drum is known as gummeta, and it is played in the storytelling folk tradition.